The marsh sandpiper (Tringa stagnatilis) belongs to the family of sandpipers, the Scolopacidae. The marsh sandpiper species is distributed in eastern Europe, central Asia, Africa, Indian subcontinent, southeast Asia and Australia. These sandpiper species are fully migratory birds. These sandpipers are monotypic species. The marsh sandpiper (Tringa stagnatilis) is a small sandpiper, measuring 20 to 25 cm in length and weighing 40 to 120 grams. The wingspan is 55 to 60 cm. These marsh sandpiper species have grayish brown upperparts in summer and pale gray plumage in winter. The underparts are white. The breast and the throat are white. There is a white supercilium. The head, hinder neck, back and the wings are heavily streaked dark brown. The bill is long, straight and pointed. The base of the bill is pinkish and the distal end is dark. The irises are blackish. The long legs and feet are pale yellowish green. The call of these sandpiper species is a melodious repeated "tuee-u..tuee-u" sound. 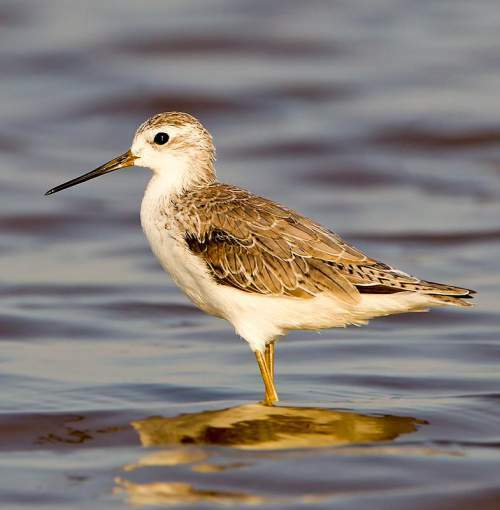 The marsh sandpipers are distributed in eastern Europe, Russia, Kazakhstan, eastern Mongolia, northeast China, Middle East, Sub-Saharan Africa, Persian Gulf, Indian subcontinent, southeast Asia and Australia. 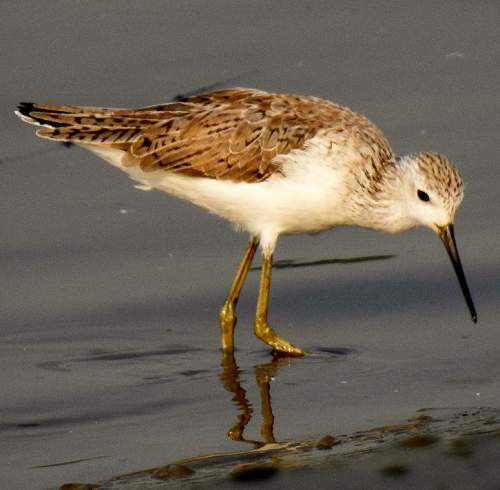 In India, the wintering marsh sandpiper populations are distributed in the states of Tamil Nadu, Kerala, Andhra Pradesh, Karnataka, Goa, Telangana, Maharashtra, Madhya Pradesh, Gujarat, Rajasthan, Punjab, Haryana, Uttar Pradesh, Bihar, West Bengal, Assam, Meghalaya, Nagaland, Manipur, Tripura and Mizoram. The Important Bird and Biodiversity Areas (IBA) of these marsh sandpiper species in China are, Chongming Dongtan Nature Reserve, Coastal mudflat of Tianjin and Lianyungang saltworks. The IBA in Azerbaijan is Divichi liman (or Lake Akzibir). The IBA of these marsh sandpipers in Sri Lanka are, Kayts Island-Mandathive, Mundel Lake and Seguwantive mudflats. The IBA in Uganda are Doho Rice Scheme, Syvash Bay and Kibimba Rice Scheme. The IBA in Tanzania is Lake Manyara. These marsh sandpiper species do not normally occur in forests. They normally occur in altitudes from 0 to 100 meters. The artificial ecosystems and habitats of these species include irrigated lands, flooded pasturelands and aquaculture ponds. The natural ecosystems and habitats of these marsh sandpiper species include wetlands, freshwater lakes, rivers, streams, creeks, estuaries, mudflats, marine lakes, brackish water lakes and lagoons. The diet of this marsh sandpiper consists mainly of insects and worms. Insects, insect larvae, aquatic insects, worms, crustaceans, snails and small fish are their primary food. 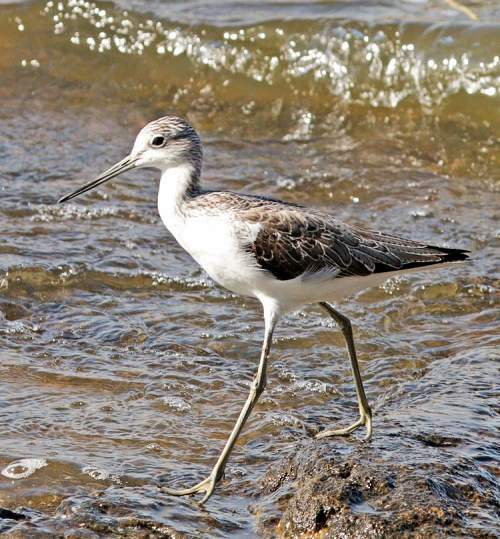 These sandpiper species pick their prey from the ground as well as from the shallow waters. They probe in shallow water or on wet mud with their long sensitive bill to locate the prey. The breeding season of these marsh sandpipers is from April to June in most of their breeding range. These species are monogamous and breed in loose colonies. The breeding sites include grassy or marshy lake-edges in warm inland wetlands. The nest is a shallow depression on a mound at the marshy edge. The clutch contains two to four pale buff eggs with heavy mottling. Both the parents incubate the eggs. These marsh sandpiper species are mostly migratory birds. The breeding populations in central Asia migrate overland on a broad front to their wintering grounds in sub-Saharan Africa, southeast Asia, Indian subcontinent, Indonesia and Australia. These sandpiper species leave their breeding grounds during July and August and arrive at the wintering grounds in September. The return migration to the breeding grounds occur during March and April. The global population size of the marsh sandpiper (Tringa stagnatilis) is estimated to be about 260,000 to 1,200,000 individual birds. The overall population trend of the species is considered to be decreasing. In most of its range, this sandpiper species is reported to be uncommon to rare. The generation length is 5.6 years. Its distribution size is about 14,500,000 sq.km. Habitat alteration and destruction, ecosystem modifications, pollution, human intrusions and disturbance, hunting for food are the main threats that are endangering the survival of these sandpiper species. The marsh sandpiper (Tringa stagnatilis) does not approach the thresholds for being Vulnerable, either under the range size criterion, or under the population trend criterion or under the population size criterion. The CITES (Convention on International Trade in Endangered Species of Wild Fauna and Flora) status is ‘Not Evaluated’ for the marsh sandpiper (Tringa stagnatilis). The marsh sandpiper (Tringa stagnatilis) is closely related to common redshank (Tringa totanus) and wood sandpiper (Tringa glareola). Current topic in Birds of India: Marsh sandpiper - Tringa stagnatilis.